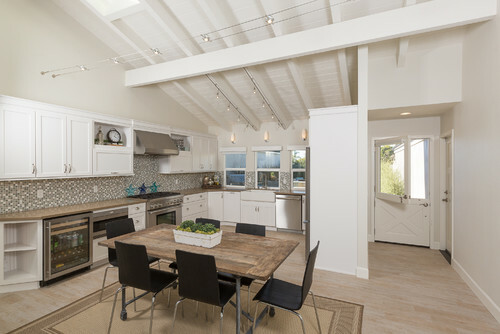 Which Is for You — Kitchen Table or Island? 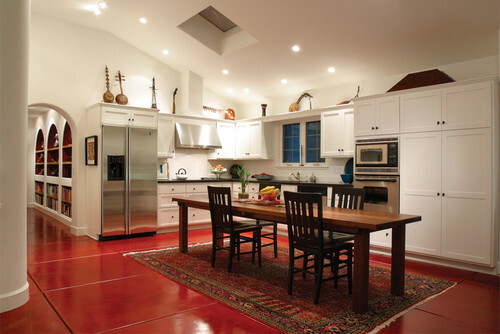 The eat-at kitchen island has become as de rigueur as energy-efficient appliances. It has revolutionized the kitchen experience, joining chef and diners in one space. We couldn’t possibly live without the island. Or could we? While the kitchen island isn’t going away anytime soon, there's been renewed interest in bringing back the humble kitchen table. If you're considering one yourself, the team at HartmanBaldwin Design/Build and others have some great tips for making it work. While most of HartmanBaldwin’s clients still prefer to have a kitchen island if they have room for it, some families are bucking the trend. These homeowners “are artists and wanted a long dining table within the kitchen where they could enjoy large dinner parties as well as a space to work on their art projects,” says Karla Rodriguez, HartmanBaldwin's marketing director. Kitchen tables double as prep space. 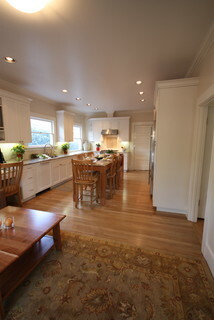 Islands obviously provide great prep space, as they often include a sink, dishwasher and trash disposal. But if you can find room for those features along the perimeter of your kitchen, you might be able to eschew the island for a central dining table that can double as a superb workstation. “For this kitchen we knew the clients would have enough workspace, thanks to the size of the table and its proximity to the cooking triangle, which gives them all the benefits of an island without an actual island,” says Rodriguez. While eat-at islands surely offer a suitable platform, some folks prefer the warm homeyness of a central table. Will you have enough storage? “Most people request an island to replace a kitchen table because they need the additional storage that an island offers,” Campos notes. If you want a table instead of an island, "make sure the rest of the kitchen cabinetry has ample space for supplies and tools,” he advises. 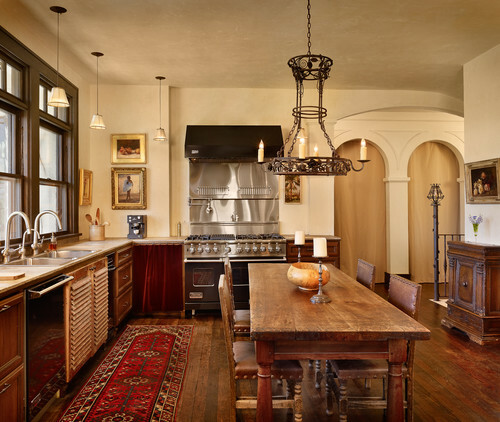 This kitchen is centered on a custom table by Terra Amico made of salvaged wood. The table is matched with six black chairs from Pottery Barn. A furniture-like black cupboard holds glasses and tableware, freeing up space in the perimeter cabinets for items that might otherwise have been stored in an island. The absence of an island allows the kitchen's length to be appreciated from every angle while letting the entertaining area take center stage. A sole dining table is a great way to incorporate a workspace that seamlessly switches over to a dining space, but it's also a place where people face one another — instead of the cook — for a type of gathering most islands don't provide. 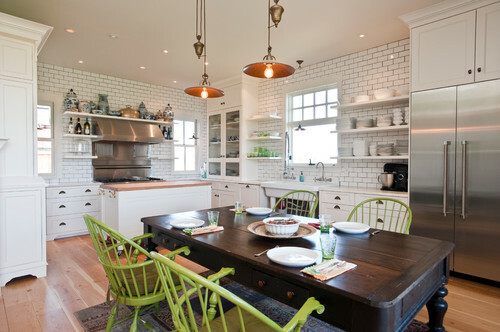 Here an antique table set with antique chairs breathes an old-fashion feel into this otherwise white kitchen by Sage Kitchens. A small rolling island in the background can act as an additional workstation when needed. 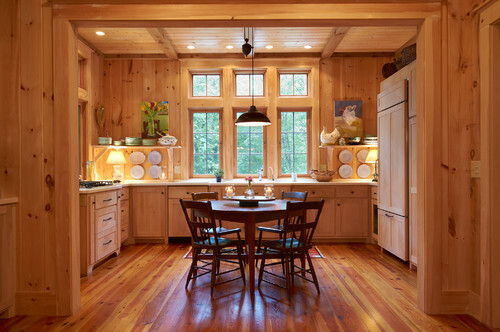 Many dining tables extend to accommodate larger groups — that's something most fixed islands can't do. What's the right shape? Round tables with pedestal bases allow a comfortable exchange between diners. Their shape allows many people to squeeze in close without anyone having to straddle a corner spot. 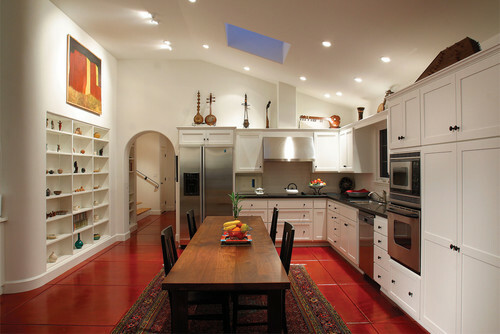 However, in a wide galley-style kitchen such as this one, a rectangular or oval table can fit more people without anyone's getting awkwardly close to the cabinetry. This countertop-height table is 3 feet wide and 7½ feet long, providing seating for six people to connect comfortably with one another in the heart of the kitchen. When the table's not in use as a dining area, the chairs can be pulled away to create easy access to the spacious workstation. Tip: When you're adding a table to your kitchen, extendable or not, carefully consider how cabinets and appliances with doors — namely, refrigerators and dishwashers, will interact with the dining table and chairs when the doors are fully open. 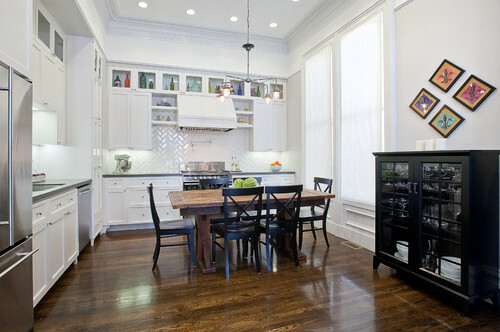 A table's dimensions (including its extensions and chairs when occupied by guests) should never compete for space with open appliances or cabinets. Lighting the kitchen table. “Lighting is something to pay close attention to when working on a tablecentric design,” says Campos. Just like lighting over an island, a central table's lighting design needs to provide good task lighting as well as warm ambience to set the right mood for entertaining.